Home Headline News Nothing Escaped Nate! Nothing escaped Nate! Floods, rivers overflowing their banks, houses destroyed, families uprooted, schools closed, roads and bridges damaged or destroyed and farms and plantations under water. Some areas worse than others. 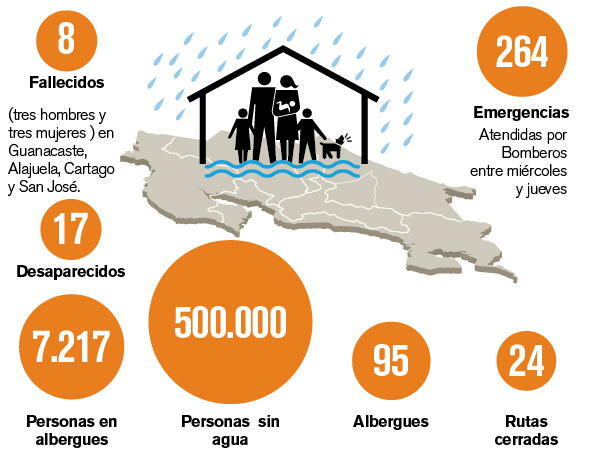 In total, the rains are the cause of eight deaths, more than 7,000 people in shelters and more than 500,000 without potable water and the closure of 24 major roads across the country. Except for Limon in the Caribbean coast, where there were no major damages. The telvision images are impacting. News crews risking life and limb to bring us reports, even live at times, of the devastation of some areas and the anguish of the people living through the tropical depression that quickly converted to a tropical storm. Roads are now raging rivers. Houses flooded, people trying to save what they can from water levels to the knees. Livestock, frightened, taking shelter dry land. Rivers with currents. Mudslides forcing road closures. Telenoticias (channel 7) and Repretel (channel 6) have been airing reports almost continuous from Thursday. 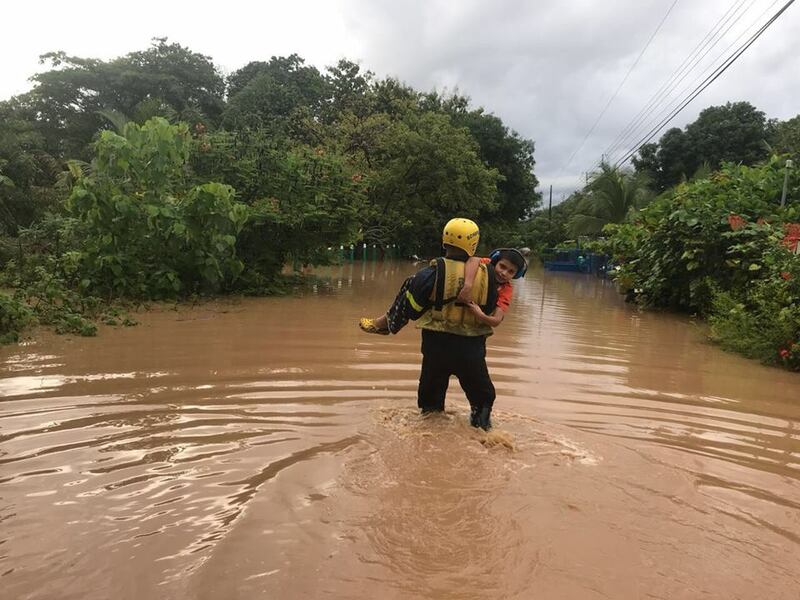 There is some good news at times, people being rescued by the brave members of the Bomberos (fire department) and Cruzrojistas (Red Cross workers), at times aided by local residents, to get to where people need them the most. Channel 7 – Telenoticias – continues with live coverage. Click at the top of the Teletica page “Ahora En Vivo” for the live broadcast in Costa Rica. Click here for the quick link. 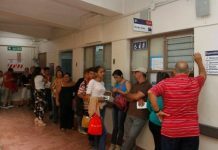 Although most of the television interview speak highly of the work by the CNE, some are never happy, with either the CNE or their local municipality for not coming to their immediate aid. In many areas – given the terrain and raging force of the water that has turned roads into fast moving rivers and the continuing downpours – it is far too “complicated” for emergency first responders to reach everyone. The list of communities (cantons, cities and towns) affected by Nate is long. Even though the sun is shining on some this Friday morning, in some even the rain has stopped, they are still in danger, as soil is saturated and still at risk of flooding from rivers. The crocodiles. 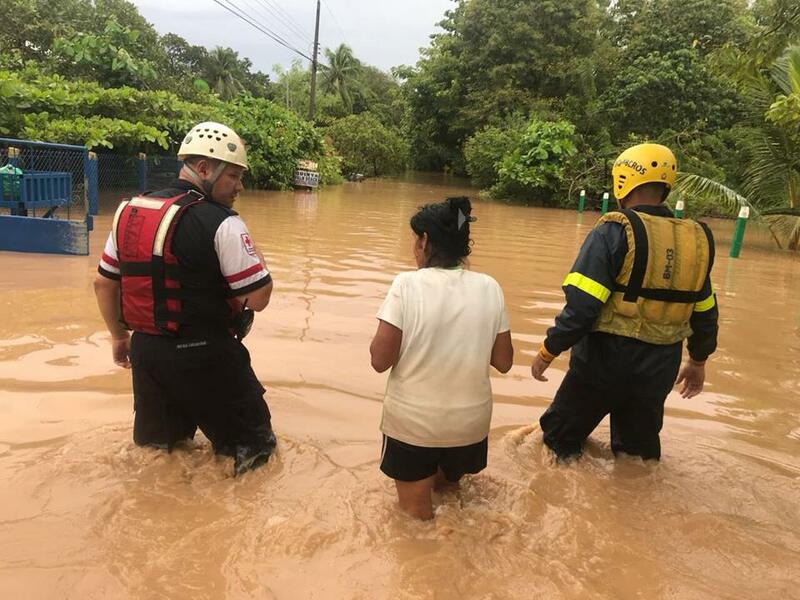 In the areas of Parrita and Quepos in particular, authorities are warning of the presence of crodociles, the equal opportunists moving to flooded areas to take advantage of whatever gets stranded in the waters. 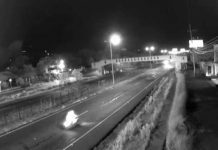 Road and bridge damage and closures. Many roads have suffered damage, some more than others, from the rains of the last two days. Up to 24 roads have been closed, most for mud and debris on the roadway, others to the danger of landsides. 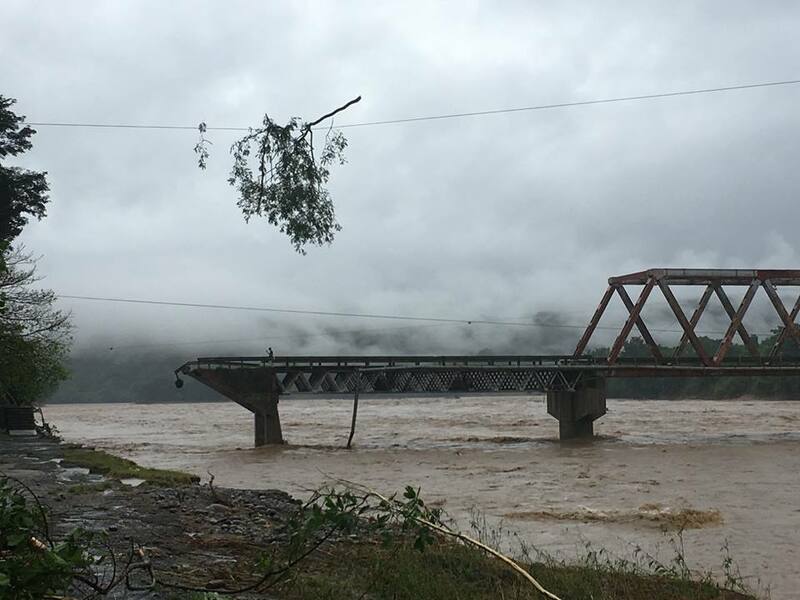 In Parrita and in the southern zone, two bridges are completely out. Public transit affected. 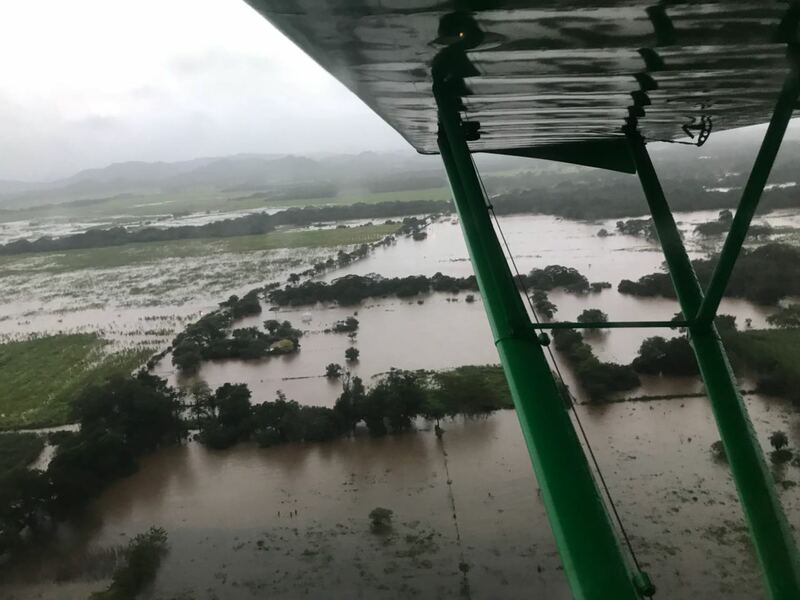 There is no bus service to many communities, such as in Guanacaste or the southern zone, where a landslide on the Ruta 2 (interamerican sur) has closed off passage from the Perez Zeledon and Paso Canoas. Getting a taxi is almost impossible, and if one is available, most likely there is no passage to the destination. The weather conditions are expected to continue until Saturday and maybe Sunday. 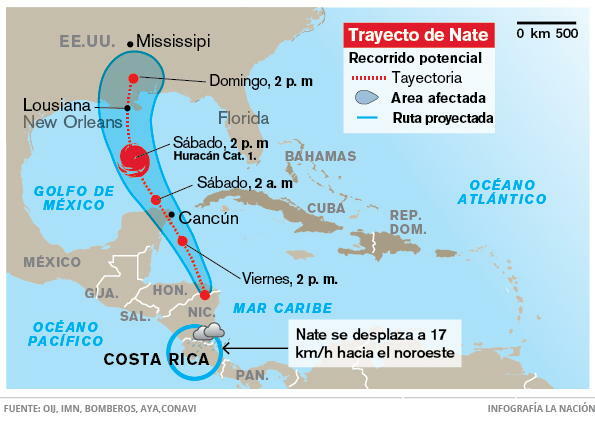 Staying in the Central Pacific, other areas affected is Esterillos, south of Playa Hermosa and Playa Jaco. In Guanacaste. The community of Filadelfia has to be one of the hardest hit. The small town in the canton of Carrillo became a lake, the main road that connects Filadelfua to Santa Cruz to the south and Liberia to the north, became a raging river. Houses flooded, some to the roof. In Carrillo, Playas del Coco, an major tourist destination and Sardinal, reported flooding. In Perez Zeledon, as the weather conditions improved this morning, allowing authorities and area residents are starting the clean up from many landslides, trees uprooted and roads washed out from the water. But there is still concern that local rivers may flood again. The failuer of the Dique del General dyke forced hundreds in the area of take shelter in the local community hall. Entire families sleeping on foam, temporary bedding provided local authorities, while they wait out the waters to reside and take to the task of cleaning up their homes. 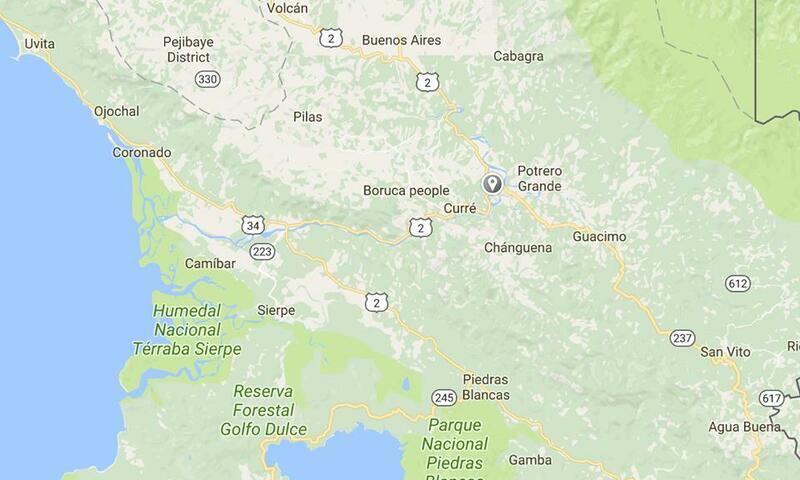 At least 15 landslides have been reported in the area of Cerro de la Muerte, on the highway that connects Perez Zeledon and Cartago. So far, the reports indicate no damage to the road, but is strewn with mud and debris. This message on Twitter says it all from Guanacaste, “Estoy triste mi bello Guanacaste” (I’m sad, my beautiful Guanacaste). The storm is now moving into Nicaragua! Following are Images from social media posts, official government websites such as Presidencia, Bomberos, Cruz Roja, Comision Nacional de Emergencias and Spanish language news sources such as La Nacion, Telenoticias, Repretel and others. Next articleStorm Doesn’t Detain World Cup Qualifier. Game On Saturday!